Habitat: Timbered watercourses to open plains. Is often observed in and around outback towns. Food: lizards, small mammals and insects especially grasshoppers. Scavenges on live and dead carrion. The Black Kite is a medium-sized bird of prey (raptor). It is also known as a Fork Tailed Kite, Firebirds and Kimberley Seagull. Black kites are often found at camping grounds and caravan parks working together to tip over rubbish bins and raid them for anything edible. These are bold birds but are also wary. Many travellers have stories of encounters with these raptors are picnic/bbq areas, where food is often stolen from tables. From a distance it appears almost black, with a light brown bar on the shoulder. The plumage is actually dark brown with a scattered light brown markings, particularly on the head, neck and underparts. The tail is forked with darker brown. This feature gives the bird its alternative name of Fork-tailed Kite and makes it easy to identify when in flight. The eye is dark brown and the bill is black with a yellow area of skin around the nostrils. Both sexes are similar. Young Black Kites are generally lighter in colour than the adults and have a comparatively shallower forked tail. The Black Kite's plumage is similar to other birds of prey (raptors), such as the Little Eagle, Whistling Kite and Square-tailed Kite. In flight, however, its long forked tail and almost unmarked underwing make it unmistakable. The Black Kite's range covers the majority of the Australian mainland. The Black Kite is arguably the most numerous bird of prey species in the world. 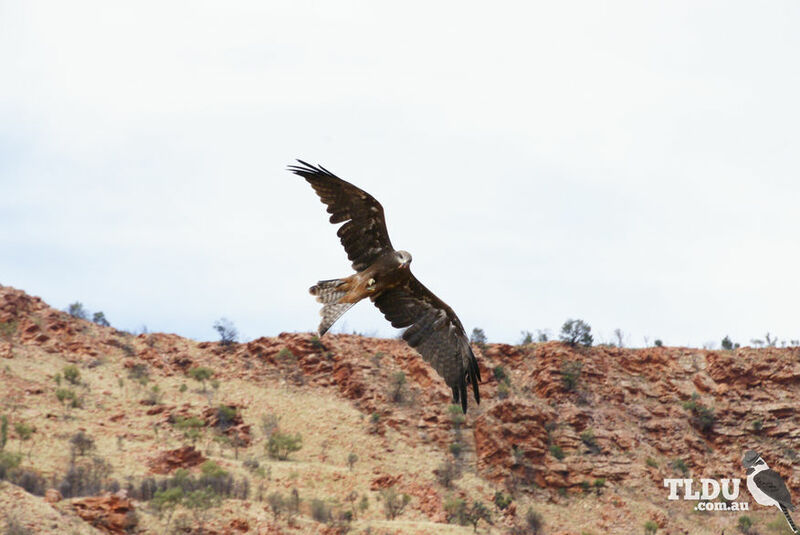 The Black Kite is found in a variety of habitats, from timbered watercourses to open plains and is often observed in and around outback towns. Although it is more normally seen in small groups, the Black Kite may form huge flocks of thousands of birds - especially during grasshopper plagues. 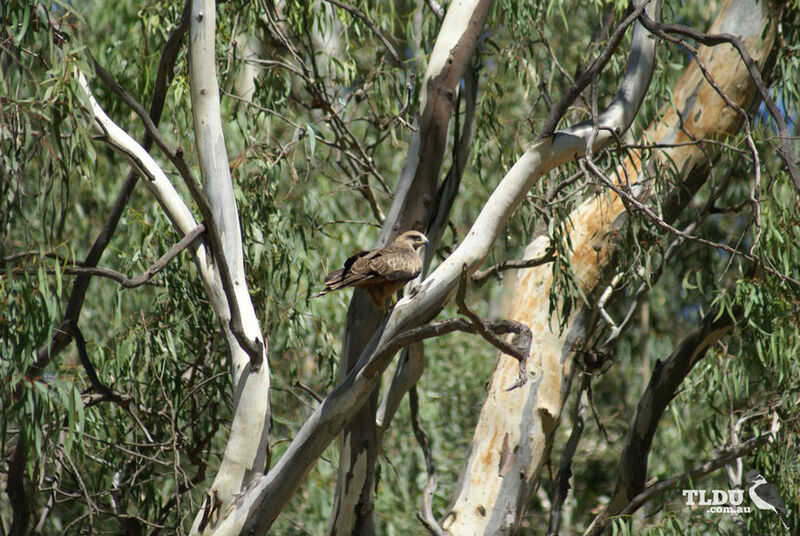 No other Australian bird of prey is seen in such large flocks. The Black Kite preys on lizards, small mammals and insects, especially grasshoppers. It also is a scavenger and frequents tips in outback towns. Black Kites also gather in flocks around bush fires and eagerly pounce on small animals as they flee the flames. Black Kites eat live and dead (carrion). Black Kites nest in isolated pairs or in small scattered colonies. As with other birds of prey, an aerial courtship display is performed by both sexes. This involves loud calling, grappling of feet (talons) and tumbling or cartwheeling. The nest is a bulky cup of sticks, lined with softer material and is placed in the fork of a tree branch - generally close to the trunk. The female incubates the eggs while the male provides food.